Droid 2 is a go! Yesterday the Droid 2 launched from Verizon Wireless and Motorola. 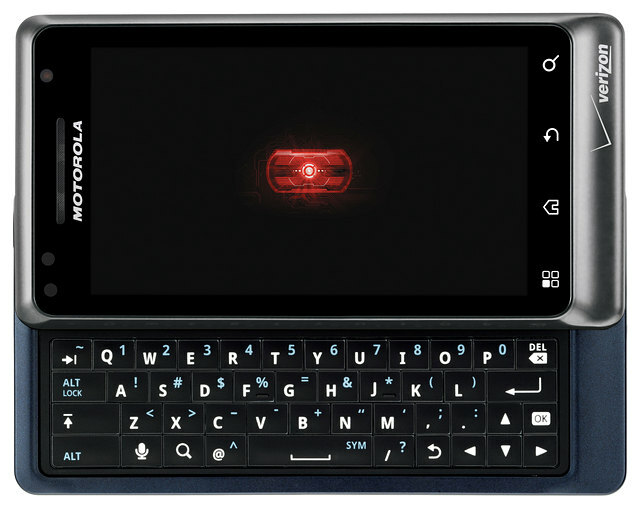 This is the replacement for the Droid 1, and still has the (updated) physical slide out QWERTY keyboard. This is packing an OMAP 3640 processor running at 1GHZ, and is the first Android phone to ship with 2.2 Froyo! There is a promotion going on for early upgrades as well right now. Make sure to keep your eye out in your mail if you’re a current Verizon customer. They are letting you upgrade to any smart phone at the 2 year contract price IF you meet the conditions. Basically, your service contract end date needs to be by December of 2010, as well as you must NOT be currently eligible for a new every two, or annual upgrade promotion. This promotion ends August 31st, so if you’re interested in checking it out you only have about 2 weeks left! You can also simply call or stop in your local Verizon Wireless retail store and have them look up on your account if you’re eligible for this promotion. Will have a review of the Droid 2 coming soon! In the mean time, check out what the guys over at iFixit did to this shiny new device. It never stood a chance! I’ve heard a lot of back and forth over the custom UI’s the phone manufacturers are placing on Android phones. HTC sense, Motorola Blur, Samsung TouchWiz, etc. They all seem to have added features that enhance or make the phone better, but they also tend to overshadow a lot of core things the OS was designed or should be able to do. I’m focusing here on Motorola’s Blur, as my current phone of choice is the Droid X, which has this installed on it. I’ll start with the pro’s. Things are very clearly accessible with the large buttons, and the “blur” widgets are a nice addition even if a little bland artistically. Being able resize the widgets is a welcome feature as well that gives them a whole new dynamic. It has 7 home screens, a customizable battery profile setting to help save battery life, and some really cool wallpapers, both static and live. Now the inevitable con’s. Although the big buttons are easy to see and access at anytime, it would be nice for a little choice in this matter. Although the phone and contacts are heavily used features, the “vanilla” android experience has the phone and browser applications pinned on each side of the drawer launcher. With all the nice customization features Motorola did add with the widgets, it would’ve been nice to see them extend that here as well. While we’re on the topic of those big buttons, they disappear when you change home screens, and switch to a pattern of dots on each side of a home button, so you can quickly jump from one home screen to another, or simply back to your main home screen by tapping the home button. This is a nice feature, except the fact that if you want to access your app drawer while this is active, you have a 2 to 3 second delay before this screen fades down and your app drawer icon and its two companions return. The biggest downfall I personally found with this, is the unified inbox. Although a good idea in theory, why would they(Motorola) ever think you would want your latest tweets mixed in with your work email, along with Facebook status updates, pictures and comments? It does have the option to view each account individually, but it’s still not straight forward and makes it very difficulty to accept this is how you should be receiving all this content. Like I said, in theory it seems like a decent idea, but the fact that it’s buggy, lacking features, and just not that user-friendly for something that is supposed to make all your email and social network updates easier to get, makes for big downfall on such a great device. Furthermore with the accounts, you need to enter all your accounts through a “My Accounts” app rather than having the individual applications in order to sync contacts from those accounts, or so on. Now you can still download the standalone applications as well, but then you’ll see duplicates starting to show up in the “My Accounts” app. This won’t hurt anything, more of an annoyance really. So with that said, how can I still be so “Xstatic” about my Droid X you ask? It’s simple. It’s an Android phone. The first thing I did after giving blur a fair shot (2 hours is fair right?) I went and installed a nice little app I’m sure any droid user is familiar with. LauncherPro. This immediately gave me all the customization I was looking for in the launcher icon area as well as much more. I can hide apps from my app drawer with it and set home screens, have a rotating home screen, not just inside of apps, and again, much, much more. The point being, with all the open customization you can do with droid(and I say open as in not needing to root or tinker with your phone to get it to work) you really aren’t stuck with any once “experience” when you buy a phone. Granted LauncherPro may not work on all android phones, but I’m sure there are other applications that might, or will be developed to work on them soon. So that is how I can still absolutely LOVE my Droid X even though it has some buggy software preloaded on it. The key to this and most phones is the hardware that’s running it. And this is packing some serious hardware. Phones that are running advanced OS’s now are more like computers. When you buy a computer you initially pick Windows or Mac, and then base your purchase on the need for how powerful your hardware should be to accomplish what you want to do with it. If something is installed on either machine that you don’t want or like, you’re perfectly free to remove it, all the way down to the operating system it comes with and install a new one. I think phones are heading in this direction which is why I wouldn’t hold too much weight or get hung up on what software overlay you like better on a phone, but more as to what full OS you like more, and the look at the hardware available. And I’m not avoiding the topic of rooting and doing all of that right now, I’m saving that for other, multiple, posts. So obviously if you were looking for an i*hone you wouldn’t have much choice in hardware. In face you don’t have any choice. But thankfully this is about Android and you have a selection of over 35 phones on all the major carries. So what does everybody think? Do you like Blur? Or any other overlay for that matter? Or is vanilla more your style?